Taking it to the next level! 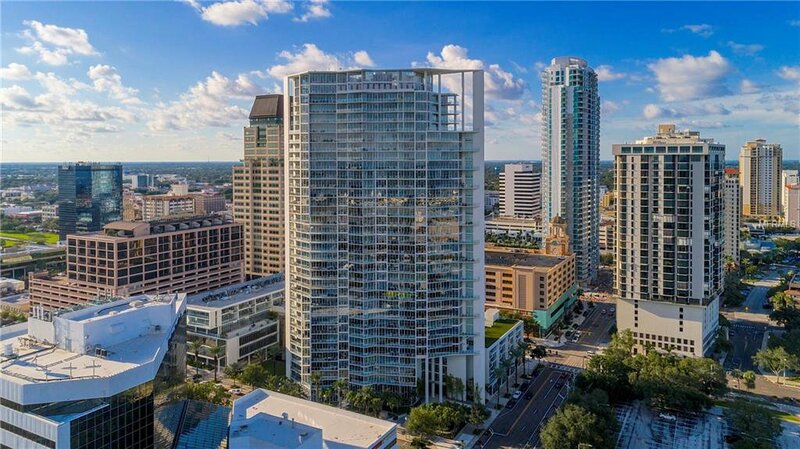 Perched 34 stories above beautiful downtown St Petersburg, the beautiful "Glass House" is a 3 level penthouse featuring award-winning modern architecture and stunning imported materials throughout. SPECTACULAR views of sunrise and sunset from all three levels with a wrap around balcony on the first floor. Floor to ceiling glass to highlight the amazing views. Open air layout with living, kitchen and dining on the first level. Featuring marble floors, and marble accent walls. The kitchen features custom cabinets, white quartz countertops with a custom mosaic Italian backsplash. Sub-zero refrigerator and Meile appliances. A breakfast nook that overlooks the water and city skyline. An elevator provides easy access to all three levels. The second level offers sweeping views, a family room, home office, guest room, and laundry. The master level is the crown jewel offering complete luxury. Panoramic views of the city, two showers, a soaking tub and separate vanities that feature marble countertops. There is an additional guest suite on the third level. Other features include a custom staircase with glass stair treads and risers, high-end custom light fixtures and wall coverings. Creston home automation system that controls the audio, window shades, climate, and lighting. This luxurious penthouse has an abundance of unique design features, but it is truly all about the VIEWS. You can have it all.. Location, Luxury and Lifestyle. There is no other place like the Glass House! Listing courtesy of KELLER WILLIAMS ST PETE REALTY. Selling Office: SMITH & ASSOCIATES REAL ESTATE.